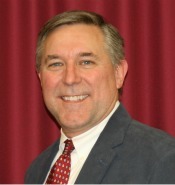 Mayor James Mueller is currently serving in his fourth term on the City Council. He began serving at-large in January 2004 and took office as mayor in January 2012. He holds a bachelor's degree from Iowa State University in business administration and also earned an MBA from Drake University. He spent 11 years as the director of financial planning for Younkers Department Stores before becoming chief operating officer for Storey Kenworthy, where he has been working for the past 23 years. Jim's current term expires January 1, 2020. Mayor Mueller and his wife Julie have three daughters, Madeline, Lindsey and Rachel. His hobbies include running, biking, gardening, fishing and flying. Mayor James Mueller may be contacted by calling 641.628.4173 or by email.